The Fellowship was fortunate enough to obtain a copy of THE BIONIC MAN VS THE BIONIC WOMAN #2 from Dynamite Comics. The story is by Keith Champagne with art by Jose Luis, colors by Inlight Studio, lettering by Marshall Dillon, and covers by Sean Chen and Jonathan Lau. Jamie Sommers is brought in by Oscar and informed of the investigation the Steve Austin was on before they lost contact with him. She retraces his steps and encounters the serial killer who has been stealing the hearts of his victim. What kind of help will she get from Assistant Director Kelsey? Is Jamie in over her head? And what happened to Steve Austin? When I first hear of this crossover, I thought “no-brainer.” I have been enjoying the individual books so I figured this would be good as well. Champagne is telling an interesting little mystery while showing off Steve and Jamie’s abilities. Jose Luis’ art is very impressive and I like his style. The battle between the two stars hasn’t happened yet…but you know it is coming and I can’t wait to read it. 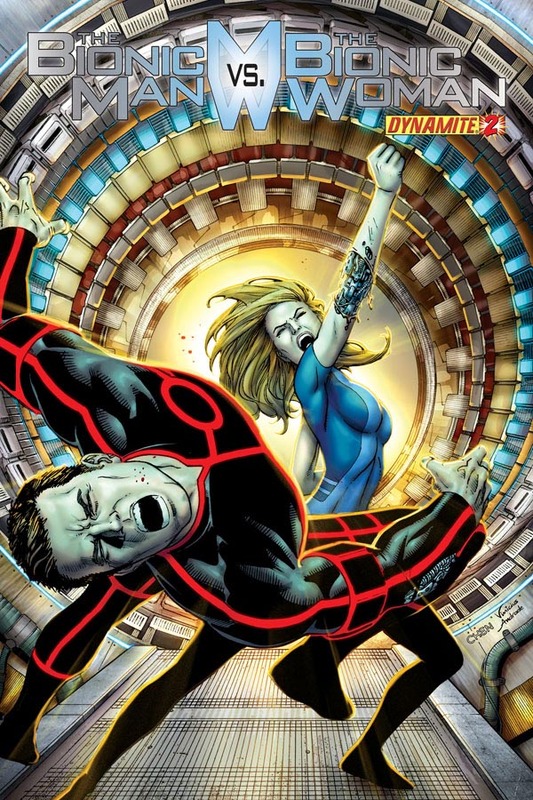 THE BIONIC MAN VS THE BIONIC WOMAN #2 is in stores now and available at www.dynamite.com.